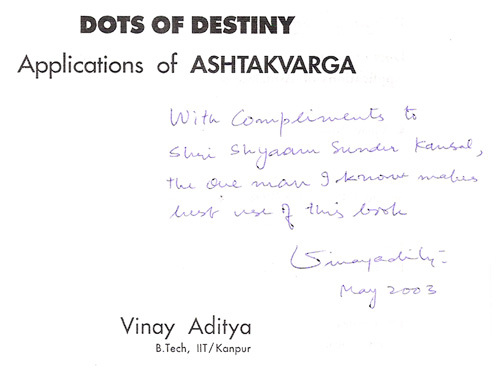 Vinay Aditya - Author of "Dots of Destiny - Application of Ashtakvarga"
Author of most read book on "Ashtakvarga"
"Dots of Destiny: Applications of Ashtakvarga"
Vinay Aditya is the author of the most authentic book of Ashtakavarga, titled 'Dots of Destiny: Application's of Ashtakvarga'. He is the associate editor of the bimonthly Vedic astrology journal "Vedic Astrology" edited by Dr Charak. After securing the Jyotish Visharad from the Indian Council of Astrological Sciences (ICAS), he has been teaching Vedic astrology for the last eight years, first at the Bhartiya Vidhya Bhavan, New Delhi and presently with the ICAS. He has conducted workshops on Ashtakavarga, Divisional Chart and Relationship Issues at the Arsha Vidhya Gurukulam in the United States for three consecutive years, and a 6-week course on 'Introduction to Vedic Astrology, for western astrologers' in Germany. He is pioneer in applying the Ashtakavarga Principals to the Divisional Charts, a technique that has proved extremely useful in astrological predications. While he holds a degree in Engineering (B.Tech.) from the IIT Kanpur, India, he has also conducted thousands of consultations in astrolgy and palmistry. Lately he has started teaching palmistry at the ICAS, Delhi. Besides being a publisher and printer professionally, he has wide ranging interests in Photography, Trekking, Homeopathy, Alternative Medicine, Transactional Analysis, Vipassana and other New Age techniques of holistic living.